Well friends, Ace Combat 7 has a release date! It's January 17, 2019 for consoles, and February 1st for PC. 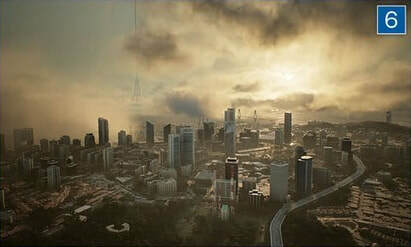 This information comes at the end of a new trailer released at Gamescom in Köln. The public could play a new mission there, and the press could apparently play one mission more. But if you're reading this, I'm guessing you already knew that. 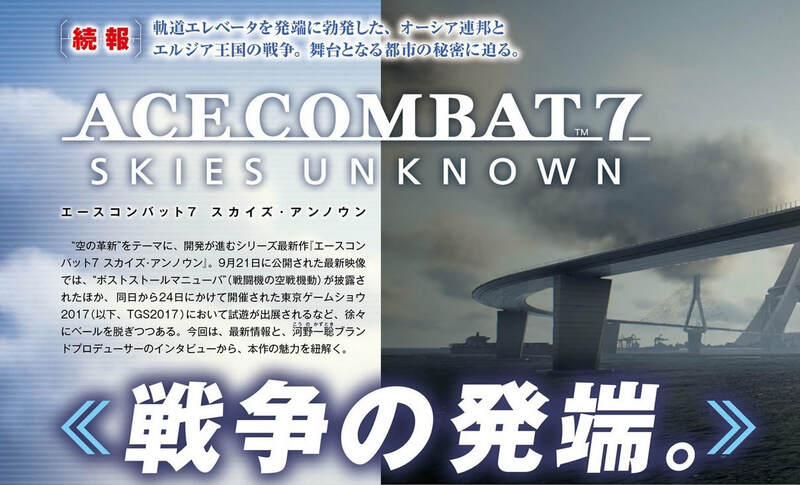 Anyway, a new show where AC7 makes an appearance means a new Famitsu interview with our man Kono. We'll summarize it for you as usual. Kono apologizes again for the wait and causing everyone to worry. He feels the pressure of everyone's expectations. He says that they're aiming for a scale and atmosphere somewhere between 04 and 5. The purpose of the trailer was to show off more story details while providing AC-like hooks with dialog and imagery. Famitsu observes that there sure are a lot of things it looks like you can fly through (tunnels, sea platforms, parts of Stonehenge). Kono replies that we have Masato Kanno to thank for that. Everyone knew this, but the plane at around 02:56 isn't a Falken. There'll be a lot of new planes in the game, which Kono says has kinda been a pain. The F-104 is playable to those who have confidence in their ability to fly around such an old aircraft. As you may have guessed, the reason two of the three euro-canards are in the demo is because Gamescom is in Europe. Kono does not elaborate on the parts system, even though he totally did to 4gamer. The demo missions are basically the same as they are in-game. They talk about clouds again, but didn't say anything new. Mission 6 was chosen for the demo because of its large scale. Kono says he's heard a lot of European media focusing on whether this game is more casual or more serious, which is interesting because I haven't heard any of that. There's also a lot of talk because flight action games are so rare nowadays. Kono says that even though AC clearly has a global audience, PA isn't making the game specifically with a global audience in mind, but rather just pursuing what they think would be compelling. The rest of the article is a description of the gameplay demo. I'll skip over what they say about Mission 6 entirely, since there's nothing they say that you can't see for yourself in gameplay footage. However, they also talk about Mission 7 (First Contact). It's another "destroy a bunch of surface targets" mission like 6, but the Yinshi Ravine somewhat complicates things. The targets are in the ravine, and a layer of storm clouds makes them impossible to see from above. The way they describe it sounds to me almost like a Sky Odyssey level, which I'm sure is a helpful comparison to maybe four people. Anyway, Famitsu guy pursued an enemy plane in to a rain cloud and had to really be on his toes to keep sight of the plane while also not running into something in low visibility conditions and unreliable instruments. They really like those clouds. 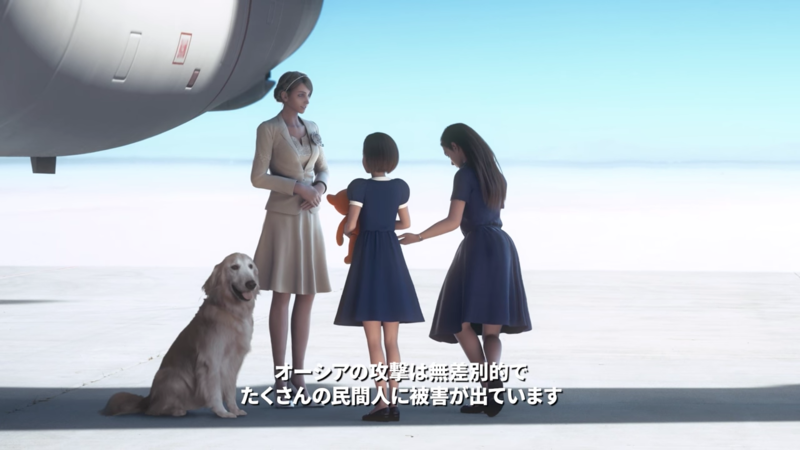 One last note: there were two lines in the trailer which I and a few other people mis-parsed at first, but which can be clarified by referencing the Japanese subtitles. 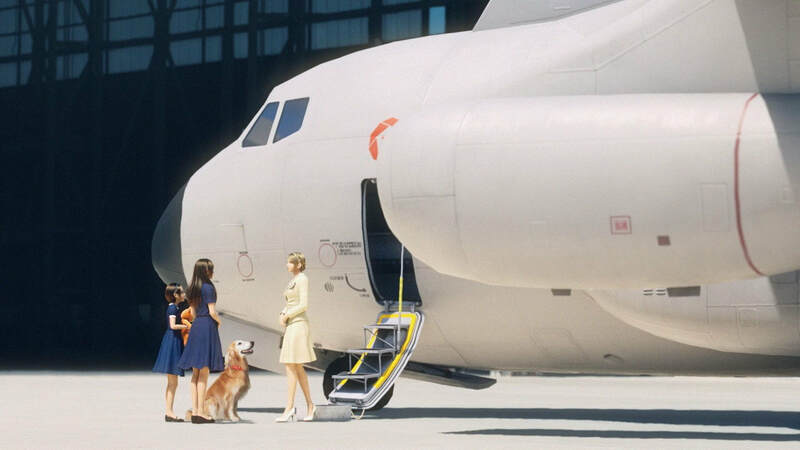 "That aircraft needs to be taken care of!" means "shoot down" and not "protect." "There are pilots like you in every generation, and I have felled every last one of them" means…well…"felled" and not "felt." Weirdly, they both have to do with the same word:「墜とす」or "tsuitosu." It generally means to "take down" or "shoot down," and it was the word at the heart of both "felled" and "taken care of." I think in context both these lines would've been a lot more clear. We've gotten a lot of information over this game's multi-year press cycle, but I'm sure we're not done until 2019 either. We'll have those updates for you when they come around, whatever they might be. Hey all! E3 2018 came and went, leaving us a new trailer for Ace Combat 7 – or so we're told, because it hasn't been released to the public yet. 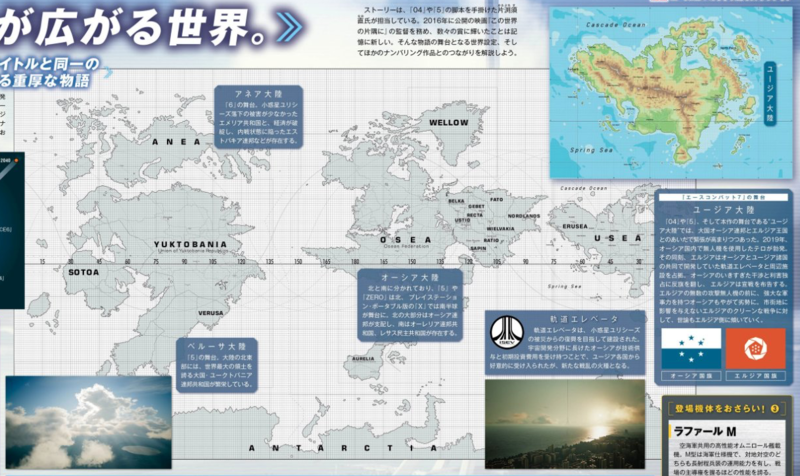 Along with the trailer came a Famitsu piece with an interview and map. Black Kite has already done a fine translation of the interview and translated Japanese summaries of the article that get everything of substance. All we'll add is that futuristic weaponry is confirmed for player loadout – the implication being that along with the futuristic planes, they will be a normal part of the game. Speaking as a curious observer, the most interesting part to me is piecing together exactly what's been going on at Project Aces by cross-referencing what Kono said at TGS 2017, but it's not my job to speak as a curious observer; it's my job to speak as a lore encyclopedist – and as a lore encyclopedist, what's most relevant to us is that big map of future Strangereal! Speculation already abounds, so here's what those text boxes say. The setting of 6. The Republic of Emmeria – which suffered little damage during the fall of Ulysses – and the Estovakian Federation – whose economy collapsed and entered a state of civil war – both exist here. The setting of 5. Thriving in the north of the continent is the world’s largest country by landmass, the Federal Republic of Yuktobania: a great power. Splitting the continent north to south, 5 and Zero are set in the north, and the PSP game X is set in the southern half. Osea dominates the greater part of the north, while to the south is the Federal Republic of Aurelia, and the Democratic Republic of Lesath. The orbital elevator was constructed with the goal of reconstructing from the Ulysses disaster. With Osea and their expertise in space development providing the technology and initial investment, they earned the goodwill of the countries of Usea, but the flames of war arose anew. 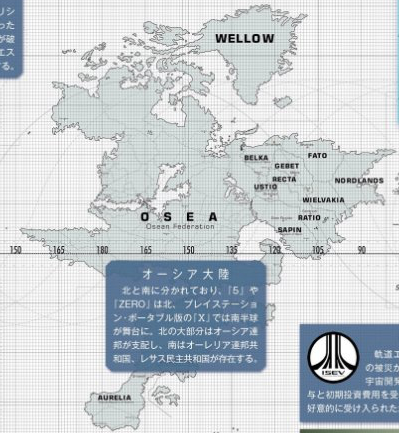 On Usea – the setting of 04, 5, and the current work – tensions have increased between the Osean Federation and the Kingdom of Erusea. In 2019, terrorist attacks on Osean soil using UAVs broke out. 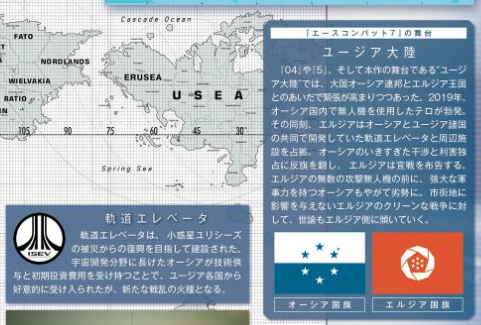 At the same time, Erusea occupied the Space Elevator jointly developed by Osea and various Usean countries. Raising the banner of revolt against Osea’s overbearing interference and monopolization of its interests, Erusea declared war. With the superior military power of Osea soon to be on their back feet in the face of Erusea’s countless unmanned attack aircraft, and the clean war Erusea has waged which hasn't affected the metropolitan area, public opinion is swaying towards Erusea. Hey all, we're bringing you something special today: a summary of a print interview with Kono. What makes it special? Well…nothing really. It's like an online Famitsu interview, but it's marginally harder to look up words. 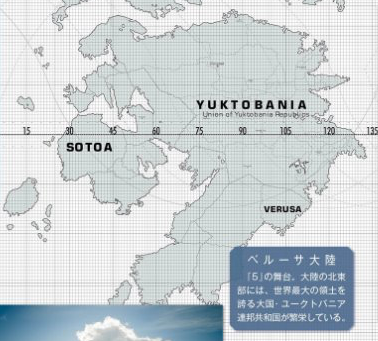 But before we get to the interview, there was also a feature on the city of Selatapura, where the space elevator is located. Seaside Selatapura, which possesses the gigantic orbital elevator, is a massive port city located on the tip of the near equatorial Gunther Peninsula in the southern part of the Usean Continent. 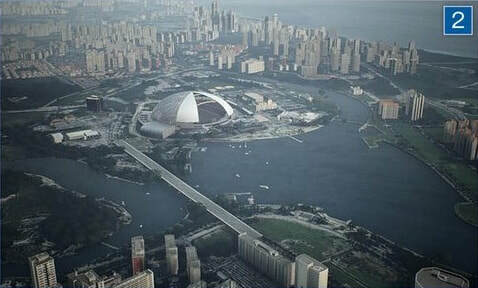 As if to overcome the hardships following the Continental War (the conflict depicted in 04), it has seen remarkable economic development in recent years, and many buildings of futuristic design rise from the city's heart. Besides the clusters of buildings, one may also see the stadium and Ferris Wheel, as well as the distinctively shaped convention center in the city's heart. At the end of the ocean-spanning bridge adjoining the groups of buildings is the shape of the sky-piercing orbital elevator. Selatapura, which is also on a major maritime traffic lane, sees many ships coming and going, and the container yards on its coastal area spread wide. Photographic scenes of the daytime scenery of Selatapura, the sun peering in through gaps in the clouds. Beautiful scenes of a sky dyed in madder red are here published. The time of day differs within the same scene, so will missions vary with different times in the same location? We ask Kono about these details directly in our interview, so check for yourself on the following pages. Selatapura’s climate is a tropical one. The atmospheric conditions are rough due to the humid atmosphere, and it’s often covered in thick clouds. Not only does the climate shift, but there are changes from time of day in this work as well. With the changing weather and time, you can experience different fights on the same stage. Kono says that post stall maneuvers were included because Ace Combat has always been about making it possible to experience what a pilot does. Actually scoring a kill with the help of one is more about style. Famitsu says it sure would be nice to have a replay system to look back on their own displays of sweet high-alpha skillz, and Kono mentions that - what do you know - they happen to be working on just such a system. However, he’s running into camera-related challenges. As he explains it, a car will take the same path in a racing game every time, but since a plane can go anywhere in a huge map, they’re having problems with the camera clipping into irregular features. Nonetheless, his approach to this new “numbered title” is “If [we feel] it should be done, we’ll do our damndest.” He really wants to please us fans. Apparently besides the atmospheric conditions already discussed, there will be updrafts and upper atmospheric jetstreams which will increase your plane’s speed. 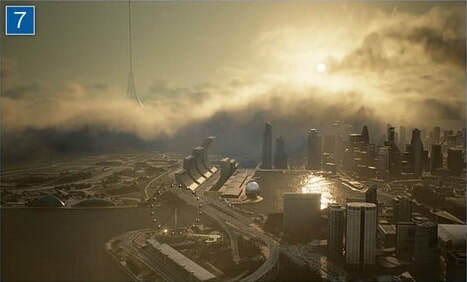 While many cities were used as reference, Selatapura is designed to look like an entirely new city. As written above, Kono says Selatapura is a city which has seen recent economic expansion. One thing he brings attention to is the difference between the center of the city with its super tall buildings, and the suburbs where nature remains. He also points to the globe monument and ferris wheel as illustrating the city’s worldview. Apparently they still haven’t decided if the time of day will change during the mission, but if it does, it’ll just be based on time elapsed in the mission, so it won’t change dramatically. The weather may change as well, since as said above, Selatapura is tropical and is subject to sudden rain. However, this too is undecided. Project Aces chose the carrier variant of the Lightning as the only variant to increase the number of carrier aircraft. Implementing the B would require a hovering mechanic, and they want to focus on including other aircraft. Famitsu brings up an element labeled “parts” in the hanger. Kono laughs nervously, confirms again that there is a parts system, and segues into talking about how you can look at your planefu – no seriously he says the closest thing in Japanese to planefu – in the hangar in VR. 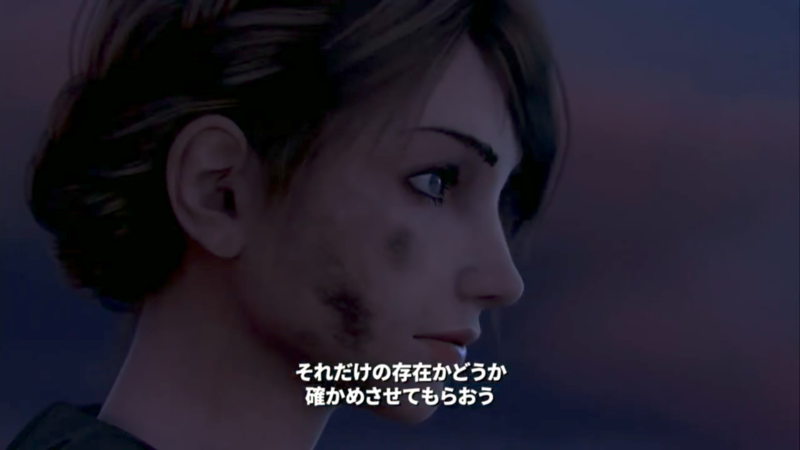 The director and producer of Summer Lesson, Jun Tamaoki, was apparently involved in this. Kono demures from giving a completion percentage and instead says they’re progressing: towards completing the goals they set in the initial stage, towards “other good stuff,” and ultimately towards the finish line. Apparently Kono’s desires to satisfy the fans with the best possible product and his desire to satisfy them by actually finishing the game are competing. He apologizes, and mentions running into various small problems. What should happen visually and aurally when the player’s plane is struck by lightning, for instance? These are the problems of AC7, and Kono wants solutions. It seems. More info on the Japanese dub at a later date. Kono says that the staff of another project commented that they'd cast well. So take that for what it's worth. Another fine Famitsu interview. What struck me is how personally Kono seems to be taking the whole thing. That, and the comment implying just how many of these ostensibly small features went beyond the initial plan. Indeed, there may well be a connection between these two things. Anyway, as always, feel free to ask questions or comment either on this post or in our discord. 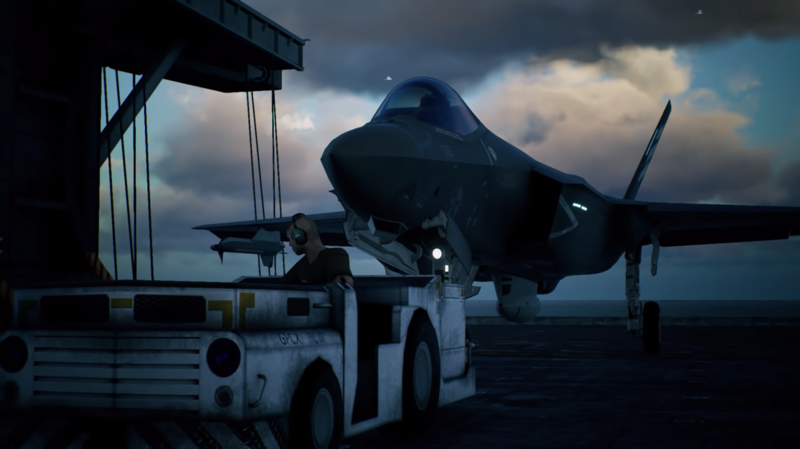 The other half of 4Gamer's Ace Combat 7 coverage from TGS 2017 has landed, and it's…well, the same single player demo that we've already seen plenty of coverage on. Nonetheless it's a short article with one or two new fragments of insight, so there's nothing lost in summarizing it. The content of the TGS demo is basically the same as that we already saw at E3 and Gamescom. The main difference is that PA finally included Japanese subtitles so the Japanese press could actually understand the dialog, though 4Gamer doesn’t actually comment on what they thought of it. There’ll be a Japanese language track with a cast to be announced. F/A-18E and F-14D are still the plane choices, 4Gamer opting for the F-14D because…you know perfectly well why. As expected, you can skip the launch and takeoff sequences. Much like Famitsu, 4Gamer is also impressed with the atmosphere and feeling of acceleration during carrier launches. Also much like Famitsu, 4Gamer is impressed by the clouds, which they say evoke a sense of realism. “The fighters maneuver with the right feeling of heaviness. The feeling seems apparent when, for example, I’m pulling back on the stick, raising the nose, and ascending.” Could it be AC7 is modeling angle of attack? 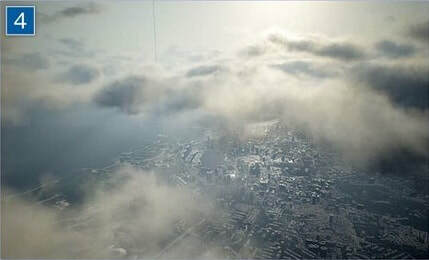 As we know, clouds in AC7 interfere with radar and reduce lock-on distance dramatically. Droplets form on the canopy, your plane vibrates in the turbulence, the controller provides feedback while in turbulence as well…actually that might be new info. Like the previous demos, once you bag the Viper Cs, the Arsenal Bird shows up and throws a bunch of MQ-101s at you. After you shoot down a few of those, you attack the Arsenal Bird itself, but after you make a few passes, the battle is interrupted and the gameplay ends with the Arsenal Bird still intact. 4Gamer does reveal that it’s possible to attack the engines straightaway, so the sequence probably isn’t divided into very many stages. I wonder if some of the same behavior used for clouds will also be applied to jammer pods. That could provide an interesting dimension - maybe even make the things useful. As always, you can get in touch either in the comments or in our Discord if you have any questions. Ace Combat 7 appeared at TGS 2017! The coverage has slowly been rolling out in the Japanese gaming press, and now we have another interview between 4Gamer and brand producer Kazutoki Kono. This one is mostly about plot, which we figure may be something our audience is curious about. 4Gamer asks how it came to be that Osea constructed an orbital elevator in Erusean territory, leading to war. Kono replies that of course he can’t give away too much, but that many countries - including Erusea - expected that construction of the elevator would bring economic benefits. He says some countries did see these benefits, and implies Erusea did not. This is one of the factors in the war. According to Kono, this is a problem with parallels in the real world. 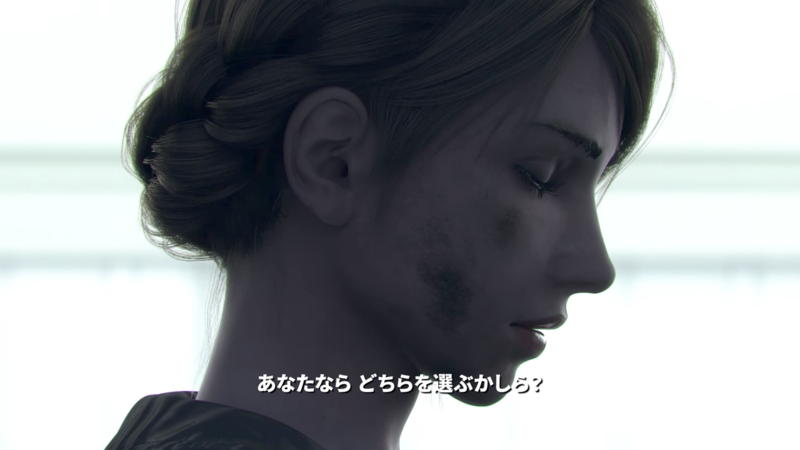 4Gamer suggests that the soot on the Princess’ face shows the war has taken a strange turn. Again, Kono naturally doesn’t want to give anything away, so he just points out that her role over time is being slowly revealed as the trailers reveal more and more of the plot, and coquettishly demurs from saying more. From there he just hits the same points he always does. It’s not a good versus evil story. Everyone’s got their own reasons for fighting, and this is what lies at the heart of the game. The princess is cute, but not merely cute. ＵＣＡＶｓ. Kono gets on the subject of the traditional Ace Combat self-insert protagonist, and talks about how much of a challenge it is from a storytelling perspective to have a protagonist whose perspective nobody else knows. I’d imagine that this must be especially difficult in a game which is, as Kono says, about the different opinions and motivations of its characters. Kono goes on to say how they struggle every time to come up with an easily recognizable icon for the player, and how they settled on the three stripes for this one. The fact that he’s seen people on twitter building kits and slashing out the unit affiliation in this way is another one of the little things that makes Kono a happy man. 4Gamer points out that Osea - the player character’s nation - is painted as a villain because of, for example, the line in the E3 trailer accusing them of harming civilians. Kono points out that the Gamescom trailer and the E3 trailer are of a pair. The E3 trailer paints Osea as “fighting for justice,” and the Gamescom trailer as Osea being the cause of the war. “Both lines of reasoning are correct,” he asserts. 4Gamer asks whether Kono can comment on the fictional plane with the white swept forward wings in the trailer. “Nope,” says Kono. Apparently someone put it into the trailer on their own, and Kono was like “Wait why is that in there?” But he gave the OK because “it might get people talking.” He justifies it as a sort of symbol of the new things you’ll come across as you progress in the story. “Game-y things are cool too,” he says. Kono confirms that the FSW aircraft is unmanned. Kono points out that while Mihay and the player stand opposed on one level, if you take a step back, you're both in the same category of pilots who stand in opposition to the imminent future of unmanned air vehicles. This, Kono says, is a departure from what 4Gamer casts as the traditional story structure of having the player and their opponents belonging to diametrically opposed camps. This is something Katabuchi and Kono hashed out together. He goes on to clarify that the fact Trigger is shown using a sci-fi laser weapon - and Erusea is not - does not play into the story’s system of contrasts - it’s just a coincidence. Laser weapons are one of the many things added to the game for variation, which also includes the clouds, UCAVs, countermeasures, and post stall maneuvers. 4Gamer points out that the Z.O.E. Falkens in ACX have “beam-saber like lasers,” which gets them onto a discussion about concessions you have to make to gameplay away from, say, how airborne lasers would actually work. 4Gamer wonders if the reason why the people in the trailers have a negative view of Osea is because they’re Erusean, but Kono says there are Oseans among them too. “Organizations aren’t monolithic,” Kono observes. You can't change your wingmen's planes. “People keep asking me about the tunnel. (laughs)"
Kono says that tunnel segments in Ace Combat history have always had mixed reception. Ace Combat Zero: The Belkan War split the difference, but this time they're approaching the problem with "STRONG STYLE." He declines to say more. Masato Kanno (art director on AC7, staff on almost every AC game since the first) is apparently really into UGSF - a hypothetical crossover universe between a few Namco titles including AC3 - which is the source of a lot of the AC3 stuff in AC7. Kono largely gave him a free hand. 4Gamer suggests that the numerous spinoffs from the numbered games suggest that the franchise has a lot of flexibility, and Kono agrees. He says there's a lot of challenges working within Strangereal's worldbuilding, but that the basic mechanics have a lot of applications that he'd like to explore. Kono draws a fundamental distinction between the Ace Combat style of flight shooting game and VR experiences like Argyle Shift which happen to use the same technology. Mainly, you don’t have the same choices. There were many people who said that you couldn’t do that kind of flight shooting in VR at first, but since there were so many people talking about the idea of flying jets in VR, Kono thought “doing something about this is the Ace Combat team’s job.” He enjoyed the R&D. Kono reiterates that Campaign and VR modes are 100% discrete, and hits some familiar talking points. The game Kono paints in all his interviews seems very ambitious, both structurally and thematically. I'm very curious to see how his team will execute on all these ideas. It'd be nice if they put some fluff material on the official site, but at this point we may well simply be waiting until the game is out. Of course if they do post anything, you'll hear about it from us. Feel free to hit us up in our Discord or the comments if you have any questions. Hello everyone! 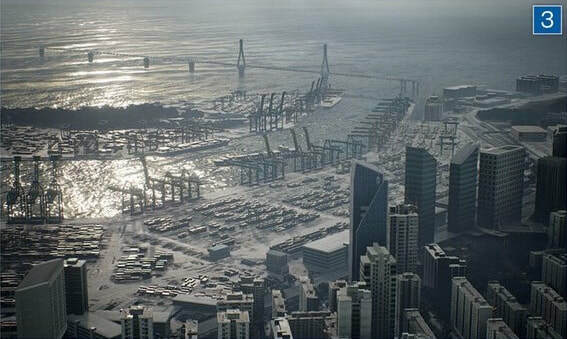 First up, NamDai decided to release a new trailer for Ace Combat 7 at Gamescom. There's little new material in it, but it still provides some food for thought. We're not the kind of blog that does gameplay, plot, or visual analysis, but there's a few things about the localization that deserve clarification and discussion. "Spare 8! Do not engage the enemy!" A fine line that lost a bit of data in English. In the Japanese, they forbid Spare 8 from getting into a dogfight with the Flanker, rather than exhorting him not to engage. The result for Spare 8 is the same, but the nuance is different, since it implies that the reason AWACS doesn't want the Super Bug to engage is because the "experimental" Flanker is especially dangerous in a knife fight, and not for some other reason. "…clearly an illegal and unforgivable violation of our nation's sovereignty." Maybe there just wasn't enough space to put the whole line in subtitles, but that entire clause is gone. Japanese Cosette simply says that "the great power Osea encroaches on us from overseas, building a titanic orbital elevator within our sovereign territory." I guess we'll see whether it's a trailer-specific quirk or whether the localization team was being bombastic again. "Concentrate on him! Shoot him down!" -was in Japanese "Get that guy! We can turn it around if we get that one plane!" The English lines in this trailer aren't so bad, but they do seem to diverge in ways which are at least mildly important. So long as the final product is good, I think us fans can forgive a few liberties beyond what's needed for good flow here and there, but I hope they're being careful. As you'll see, translating Sunao Katabuchi's work isn't something to be taken lightly. 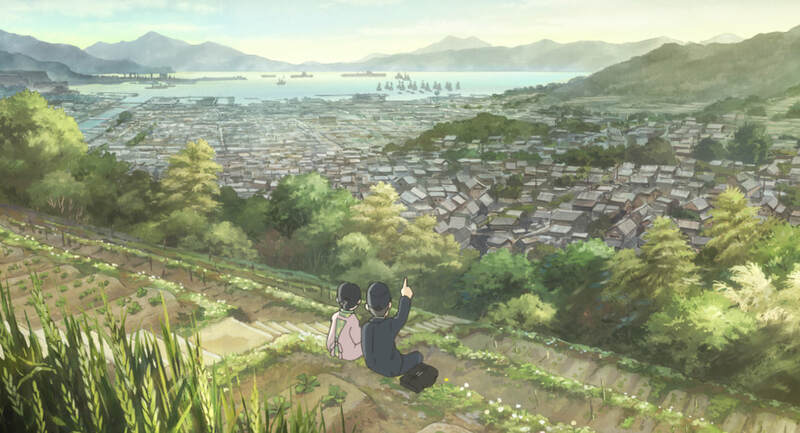 Sunao Katabuchi recently wrote and directed a wonderful film called In This Corner of the World. It's about the life of a young, newly wedded woman named Suzu Hojo (nee. Urano) in the town of Kure - a major Japanese military port in the Hiroshima prefecture - during the final days of World War Two. It's a simple story of a woman and her extended family told as realistically as possible, with no desire to shock or impress. No more, no less. With realism as its main goal, it's also an honest examination of the effects the war had on the daily lives and attitudes of the people who lived then. Suzu takes a lot of pride in continuing to live her life as the American bombing campaign continues, seeing the surrender as "giving in to violence," even as the movie makes clear that the war is hopeless and brings only needless suffering. Earlier, Suzu takes cover with her father-in-law Entaro and her young niece Harumi during an American carrier strike against ships in the harbor. Entaro points to an N1K-J Shiden dogfighting an American plane, and expresses his pride in having worked to increase the output of the Nakajima Homare engine powering it to 2000hp. Young Harumi struggles to scream over the engine noise and explosions, "what about the American engines?" The noise consumes her question. – What were the circumstances that led you to be involved with the Ace Combat series? The people in Namco’s Ace Combat team knew Eiko Tanaka (representative of Studio 4ºC, which produced Princess Arete), and this led to talk of whether or not to have them make the in-game images. When Tanaka heard it was a fighter game, he decided to come and talk with them together, and I get the sense that's where they hammered things out. It was either after the first screening or when we were dubbing Arete, but the very next day I was off to go see a Japanese Navy airstrip in Yokosuka. – I guess that was your disposition for painstaking research at play. What kind of tone does Ace Combat 04: Shattered Sky [sic] (released in 2001) have, being made in that manner? Ace Combat 04 is a close up of an ace pilot in the jet age. I knew I wanted to make a story like those you find in military aviation history, so following from that he’d have to be like this, and like that, and when it all came together I figured I could make him the so-called “final boss.” And yet, I wanted to make him a sympathetic person in the highest degree. That’s not really something done in games. But it’s war, after all. Isn’t it a good thing for there to be life in the opponent you’re taking down, and to make the moment when you defeat the strongest foe a sad one for the player? That’s how I thought of it. – It felt very fresh at the time. Maybe it’s because I did it without knowing anything about games. Is it really okay to have an enemy pilot, create a neighborhood, have a young boy and girl protagonist become involved, and then have this person appear as the last boss to be taken out? I was torn, but I decided it’d be for the best. Hayao Miyazaki often draws people who fly, but Ace Combat 04 had a ground level perspective: a boy who lost his family when a destroyed plane crashed into his house. This boy can only look up at the sky. Suzu doesn’t fly herself in In This Corner of the World either. She’s the kind of person who doesn’t even fly in dreams or fantasies. The sky above her is where horrors come from. Maybe there’s a direct line from Ace Combat to this depiction. I think people who play Ace Combat will understand. ​Alright, we've got another interview courtesy of 4gamer, and as far as interviews with Japanese press go this one is pretty interesting. It touches on a lot of the same material, but the interviewer does ask about some things that were never touched on elsewhere. The game takes place at the same period as ACX, but the two aren’t connected in any meaningful way. Kono is insistent that this game is a continuation of AC04, AC5, and AC6 (but never mentions ACZ). Kono says that it's better to use VR with a control stick because it helps with motion sickness. At first blush this might sound like “Hey, buy our control stick,” but this is actually a well understood facet of VR. It helps with discomfort to have the motions of your real hands and your VR hands be as similar as possible. Of course there will be superplanes, and according to Kono, they will have new "gimmicks.” Kono takes this moment to remind us how difficult making new models in high res is, which may be a very Japanese way of saying “Now don’t expect too many.” Or it could mean nothing. We already knew this, but post stall maneuvers are a thing, and they aren't just "press X to kulbit." You can enter post stall by entering stall conditions in level flight and raising the nose and throttle slightly at the same time. However, Kono says that there probably won't be any real applications to this besides just being cool. There will be multiplayer, but Kono is tight lipped about it. My guess is they're not planning much, but we'll see. Kono reiterates all the things he said about clouds before, and clarifies that weather won’t significantly affect gameplay. It would distract too much from the core pillar of flying around and shooting things. That said, another design goal is to make the landscape seem alive as well. 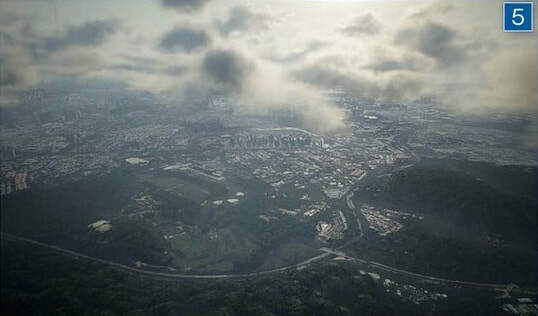 His example is that in the demo, if you descend below the clouds, you can see squalls over the tropic jungle, and if you fly low enough, you’ll see startled flamingoes taking flight. He goes on to say that there are two stages to training players on Ace Combat: how to control the plane, and combat. If you make the first stage too simplified, you chase away all the previous players. He reiterates previous interviews, stating that the player’s development as an ace pilot is an experience most associated with RPGs, going on to say that Japanese fans should appreciate that aspect in particular. Kono promises that there are actual reasons for the Kestrel II’s appearance. He says this idea developed after consulting with Katabuchi, which raises all kinds of questions about his involvement. He makes it sound like it was he who came up with the idea to include a “Kestrel II” and Katabuchi’s job to make sense of it. It would be very nice to find an interview with Katabuchi or the nominal game director Yuta Hamanka, but Katabuchi is busy doing the circuit for In This Corner of the World, and at any rate Kono seems to have either been anointed or anointed himself as the face of the franchise. I did find one recent interview with Katabuchi that brings up AC04 though, which could be the subject of another post. For now though, if you have any questions, feel free to leave a comment or check out the discord. We've decided that doing summaries of interviews instead of complete translations is more efficient - both for you the reader and for us. It means we can get information out more quickly and you don't have to rely on google as much. So to start off, we've summarized…an interview which BlackKite2128 over at r/acecombat has already summarized quite well! Auspicious. But we're sure not going to complain about more Japanese speakers active in Ace Combat circles. Here's the points that stuck out to us. Kono says the decision to return to the numbered titles came because of the confluence of the release of next gen consoles and the 10th anniversary of the release of the last numbered title. The decision to go ahead with AC7 came before Infinity entered production, planning beginning some three years before launch. The idea to make clouds a feature comes from that period. Kono claims that there are lots of ideas in AC7 which weren’t practical on last gen consoles. Infinity was made first because that’s just what resources the team had available to them to make. Kono also says he wanted to give fans a kind of rallying point. A “place” as he puts it. At first they didn’t anticipate doing VR, but when they learned it was an option, they jumped at the chance. Apparently getting to the point where it didn’t cause VR sickness was extraordinarily difficult. Kono admits this is a bit of a post-hoc justification, but he says the demo includes a Tomcat and Super Bug because the Tomcat is famous and the Super Bug is a real life workhorse. They’re naval planes because they wanted to have the demo show off carrier ops. They intend to include about 30 real world aircraft. He doesn’t specify that they’re playable, but it seems implied? If they had repurposed old assets from the start they could probably increase that number, but Kono says that’s not what they’re doing. Not specifically Ace Combat, but Kono says they aimed to model each individual rivet, which is verbatim one of the talking points in the Famitsu writeup. Japanese game journalism! Apparently the art team is particularly occupied with getting all the panel lines right. Keiki Kobayashi was the first person Kono called when the project started up, but as BlackKite pointed out, he also mentions bringing other people who worked on Ace Combat onboard. An "all star cast" if you will. Just in case this was somehow a question, Kono makes it clear that even though you can’t kill the Arsenal Bird in the demo, this is just the first encounter. You're supposed to get a sense of how the UAVs fight (read: they throw themselves in front of your missiles). Kono sells the story in 04 as Katabuchi’s and doesn’t mention his own involvement, which is odd given how firm his own agenda seems. Is it really Katabuchi in the driver’s seat, or is he just selling us a game written by the director of In This Corner of the World, AC04, and AC5? The interviewer asks which country the player comes from, and Kono replies that he wants to reveal more details slowly, giving people the chance to think about the two countries. This is an oddly specific yet spontaneous question with an oddly coherent answer. Kono goes on to say that the conflict isn’t just between two nations, but between manned and unmanned aircraft, new and old generation, and other stuff. It’s not a simple story, he says. Kono says in a bit of a roundabout way that one of Ace Combat’s selling points is that it’s one of the last holdouts of the arcade flight combat genre. Anyway, if you have any questions, hit us up on the discord or in the comments section. Since part of the reason this site exists is as a repository for Japanese language Ace Combat material, Zaku’s letting me use the blog to post translation-related stuff about AC7. ​First up, a translation of the interview segment of this Famitsu article. The writeup on the first page is pretty much just a walkthrough of the demo, which we’ve all seen for ourselves, and will eventually get to experience for ourselves anyway. The interview with Kazutoki “key man” Kono following it is much more revealing. 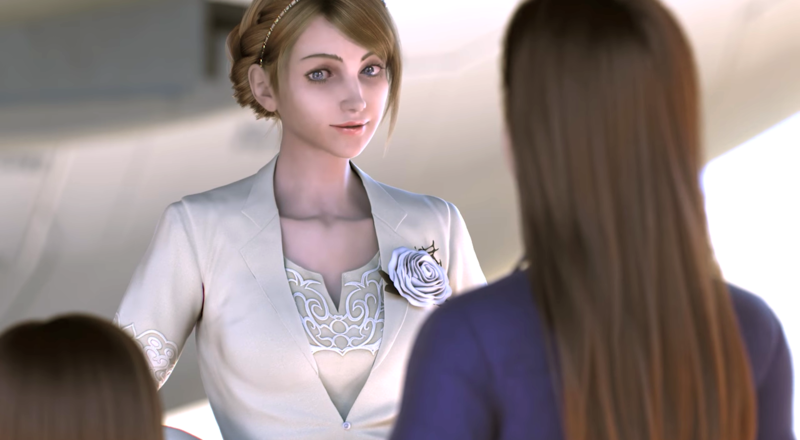 A new PV and playable campaign mode demo for the project were exhibited at E3 2017. What were the contents of the PV and playable demo like? Being curious we put a few questions to the key man behind the project, Mr. Kazutoki Kono. ——The release date has been pushed back to 2018. To start off, could you tell us a bit about why? Kono: I would like to offer my sincere apologies to all our fans for making them wait. We are continuing development around the concept of “innovation in the skies.” We released a build for E3, and things are taking longer than expected due to brush up work and concept implementation. We believed it would show ingratitude towards all the fans who have supported us for so long to push ourselves to get it out the door unpolished in 2017, so we decided to push back the release date. ——Are partial PS VR support and attempting so many series firsts some of the reasons why? Kono: PS VR support is a challenging aspect, but this project is not VR exclusive content. In order to further raise the quality of the main part, there are so many things we have to adjust, and… For instance, what kind of tactics will arise when an enemy enters a cloud? How should being in a cloud effect missiles and radar and stuff? Introducing just one element increases the amount of stuff you’ve got to think about like crazy. I can take a practical tact towards the game and do away with some things too, but bringing the idea of “innovation in the skies” home is eating up development time like you wouldn’t believe. ——But I think that the defining characteristic of the Ace Combat series isn’t the pursuit of realism, but rather its accessibility as a game. Are you worried about that as well? Kono: If we were to pursue simulator elements and physics 100%, the game would become entirely too difficult, and it wouldn’t feel right. It’s necessary to find an Ace Combat-like balance - an entertaining lie. Bringing home the experience of how great it feels to be immersed in a story within this balance and becoming an ace pilot is what we’re pursuing in development. ——I played the version exhibited at E3, and I noticed a few things which have evolved. In particular, the water droplets on the canopy moved. Kono: The representation of water droplets was very popular with the developmental staff too. Water droplets form on your canopy and then freeze when you enter a cloud, which besides being very pretty and immersive, gives you a sense of the temperature and texture on the inside of the cloud, which is something we’re very proud of. ——I got the feeling of the cloud’s thickness and temperature. Kono: This is just my personal obsession, but my rule for this game is not to merely represent things with objects, but for you to be able to grasp the situation just by looking around. If you’re able to judge a cloud’s qualities by looking at it - like that if you’ll run away into a cloud you’ll be safe, or on the other hand if the clouds are thin it’ll be dangerous - you’ll be able to turn this into fighter tactics. If we represented “this cloud’s thickness is 70%” with a gauge, it’ll become a game about minding your status instead of keeping awareness of your surroundings, so I made this a goal for the game besides visual realism. ——The way the radar went blurry and giant shadows appeared when the Arsenal Bird entered a cloud was impressive. Kono: How things will ultimately be represented, even including whether the radar will go blurry or not, is still in the midst of brushup work. Should the effect on radar when you enter a cloud be to go blurry? Does that work? Does it stand up to my rule? I’m always thinking about this stuff. I said this before, but with every single thing we implement, I have to follow the same thought pattern: what will its impact be on the game? On tactics? On my rule? Like, “what happens when a stealth plane enters a cloud?” Can you handle both with blurriness? When making adjustments, and when we’re in a situation where we’re wondering which would look best to our customers, we have a conviction to find what’s most intuitive by reference to the rule. ——UAVs (unmanned aircraft) figure in this project in a serious way, so do you have similar convictions about UAVs? Kono: UAVs also figured in Infinity, but if I can speak in due candor, we have a ways to go with “UAV-ness.” We’re delving pretty deep with this project. We’re still figuring out how to represent it, but they can fly in ways manned aircraft can’t, they sacrifice themselves to defend their target…I tell my staff “Think how an AI would feel! What would you do if you were an AI?,” which is really just an inscrutable thing to say. To the game, everything is an AI. (laughs) Furthermore there’s an element of contrast in the story between the UAVs and the F-104, once said to be “the last of the manned fighters.” This isn’t limited to Ace Combat, but I’m of the opinion that there’s a lot to think about in that contrast, so that’s something you can look forward to. Clarifications about some of the story and characters!? ——What are the highlights of the trailer first shown at E3? Kono: There’s new information in the E3 trailer. It touches on story elements and character names which have been hazy up till now. Like the Erusean Princess Cosette. 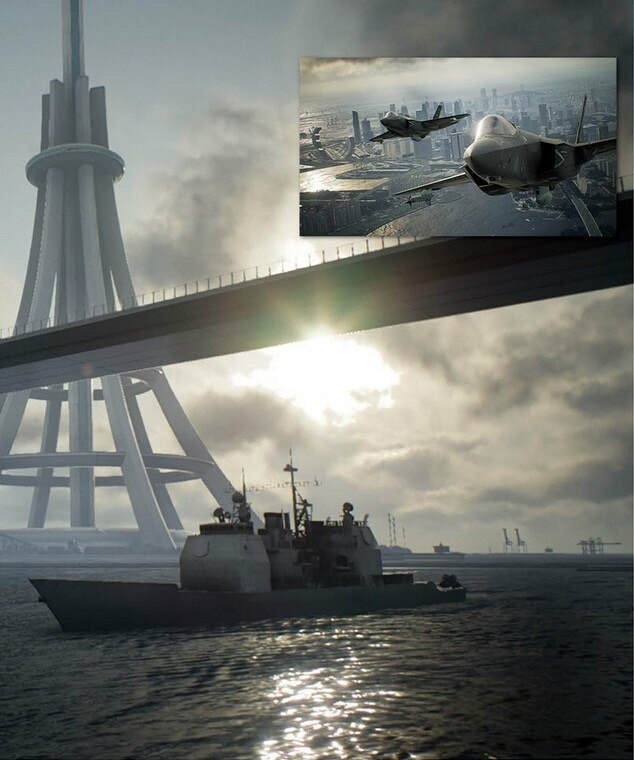 We included scenes like that one and the appearance of the aircraft carrier “Kestrel II” that would put a smile on the faces of series fans. Besides that, a place named Farbanti from 04 was in there as well. We coined the term “Strangereal World” when we were making the world of 04 using improper English grammar, but coin it we did. From that point on, for whatever reason, it’s become established to users around the world as “Strangereal.” For that reason, “True Strangereal” (laughs) is what we call the world based on 04 from which the numbered titles have stemmed. Of course, the strength of that backbone is a tool to give birth to drama, so we’re making it such that newcomers can go “I want to immerse myself in the sky’s beauty,” and experience the intricate drama of the story and go “this is really meaningful,” even if they’ve never played Ace Combat before, so by all means you should check it out. 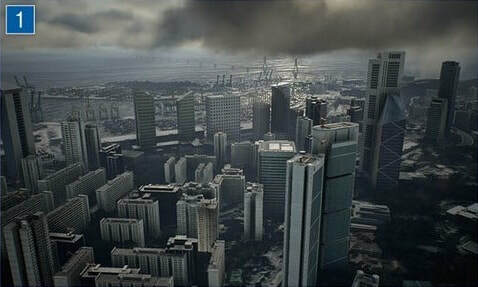 ——The scene of the two countries fighting around the orbital elevator was impressive. Kono: Erusea has occupied the orbital elevator in the current trailer. However, soon afterwards Erusea issues a claim with Princess Cosette’s saying “Osea’s attacks are indiscriminate.” One of the themes of this project’s story are the Ocean and Erusean claims and how they contrast. It’s the same war, but if you change what side you view it from, your interpretation changes as well. I look forward to hearing how people feel about the story of this one, listening to each country’s messages. The truths of all the main characters are as a mirror reflecting your own appearance. The truth is that contrast is a theme we’ve already done, so the core theme of this one is “reflection.” This is the theme which the PV sets up. ——I look forward to a followup report! Will there be an opportunity for Japanese fans to try it for themselves in the future? Kono: I can’t announce anything concrete, but I’d like to hold an event where Japanese fans can experience it. We’d talked about it a bit earlier, but we’re designing it so even inexperienced people can fully enjoy it. Stay tuned for more info. We’ll explain details of the story and other deeper part later. Furthermore, there will be an article in June 29 2017 issue of Weekly Famitsu (release date 6/15) as well, so check it out. We are lucky that Kono is the kind of guy that rambles off on his own without the interviewer prompting him. He doesn’t have the kind of immunity from his superiors a famous auteur like Hideo Kojima has, but the degree to which he’ll talk about production problems and philosophy is greater than you usually see from a Japanese developer giving a promotional interview. Anyway, there are a few lines in the E3 2017 trailer which have sparked discussion. I’m not about to go casting aspersions on the localization team, but I think it’s safe to say some elements of the localization are…curious…and deserve clarification. From 00:33 in the trailer, a news anchor says that the Oseans launched an attack from “their aircraft carrier and the Kestrel II warship.” Or maybe they say “in the Kestrel II warship.” Either way, it’s a strange line. In their version of the trailer, the Japanese subtitles read “Naval aircraft from the Osean Navy carrier Kestrel II have commenced attacks against the capital city Farbanti.” If I had to speculate, I would say that this was a voice actor ad-libbing to fit the lip synch, but that would presume things about the state of the production which we can’t know. Princess Cosette tells us in English that the Osean attacks have “remorsefully injured countless innocents,” but regrettably, the Japanese speaking Oseans feel no such remorse. The Japanese subtitles for that line (00:52) read “This is Princess Rosa Cosette d’Elisse. The Osean attacks have indiscriminately brought harm to many civilians.” I leave it to the reader to decide whether this is an esoteric but canonical use of the word “remorseful,” or whether the voice actor simply stumbled over their line and they kept it. ​At 01:01, a man says “who cares” about who started the conflict. This is a fair sentiment, but his Japanese counterpart is more reserved, merely stating that “it’s unclear.” We may not know who this character is, but the localization is already changing his personality. There are a few other more nitpicky items - “Erusean forces” are occupying the space elevator, not specifically the air force - but those are chaff. These are the three lines someone looking askance at the localization should care about. We'll see how all this bears out as the game matures. If we learn anything else, you'll read about it here.